Station 8 has gone Hollywood with The Bachelor! because Station 8 is in this episode! 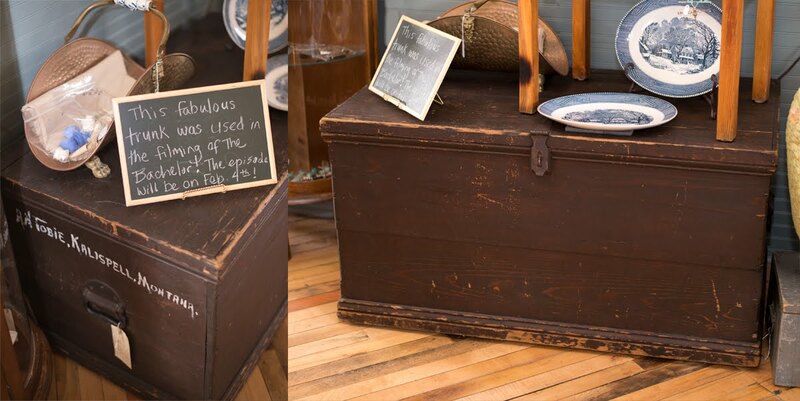 This gorgeous leather sofa and antique trunk were used in the filming of this Monday's episode! That's right! The set designers came into the shop needing props for the "glamping" scene (glamour camping) and fell in love with this antique leather sofa and trunk! So exciting isn't it? They filmed in Whitefish and other parts of the Flathead, and .....the bachelor Sean, arrives in a sea plane operated by my husband, Peter's compnay, BackCountry Flying Experience! I was standing there watching the plane take off and land, and I even got to hear the communication between the pilot, Scott Wolff,(Peter's good friend) and the film crew!! Oh it was fun! When the bachelor got out of the plane, I was within a few feet of that handsome hunk! I will be watching for the glamping scene--and trying to spot our furniture! Can't wait! I hope you get to watch it too, and say a cheer for Montana! We've gone Hollywood! Just showing these amazing antique lockers that we love! The interiors could have baskets on the bottom to put sports equipment in, or sports shoes, or seasonal clothing. The possibilities are endless! Notice the interior hooks: perfect for hanging sports equipment, hoodies, and keeping apparel up off the floor. And the rustiness can be taken care of by spraying two coats of matte polyeurethane, so that anything touching it will not have rust rubbed off onto it. A great set for kids room, mudroom, entry, or wherever you want stylish retro organization! Just had to share these yummy lockers with everyone. A bit of freshness for you! Time for a fresh pop of pretty pastel pink to help us get through some grey days! Sometimes the neutrals just need a fresh color to keep the inspiration coming. We took this neutral creme and taupe dining table, added a "script" french linen table runner, then layered on the pink hues to warm it up. The contrast of pink with black and toile just seems to work! And what room can't enjoy a bit of pink in an accent table or a vintage hamper? We used a vintage ballerina tutu and used it almost like a placemat to act as an anchor for these cloches. And under the cloches? Old hinges! Instant art! Hope you got a bit of inspiration here! It's been awhile since we've chatted on the blog.It may seem like we've been napping, but we've been working really hard! We're back and ready to rock this year! and marking down lots of furniture and goods we want to move out and make room for new arrivals!! and check out our facebook page too--lots of great photos there!